Akyumen announced its Holofone Phablet. The Phablet will be available from September 1st. The main feature of the phone is its Dual OS mode support for Android and Windows 10 PC(yes it’s Windows 10 PC not Windows 10 mobile). The phablet also comes with a built-in projector. Intel Cherry Trail 8300 Quad Core. Windows 10 OS and Android Lollipop. WiFi, WiFi Direct, Bluetooth, GPS. 128 GB Storage and Upgradable. Projector Screen Up to 100 inches (diagonal). Luminosity Up to 35 Lumens. 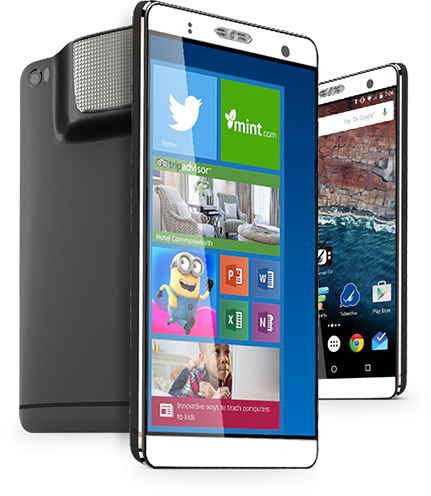 The Holofone phablet will start from $750 to $950. High-end model will include Bluetooth speaker, game controller, and battery stand.